The scarf is more than an accessory; it can transform your style to another place or time. Scarves have the unique ability to endure passing trends while defining individual styles. Let us study some easy ways to tie the scarf. Drape it around the neck. Take both loose ends up and under, creating a loop. Pull the loose ends through, pull it to one side and adjust. Make one side of the scarf longer than the other. This is the end where you will be making the bow. Make a loop at the longer end, ensuring you hide the end of the scarf. Also make the loop in an upward movement and not a downward one. Now make a bow of the same end. Hold it in the center. Wrap the shorter side of the scarf around the bow, in its middle. 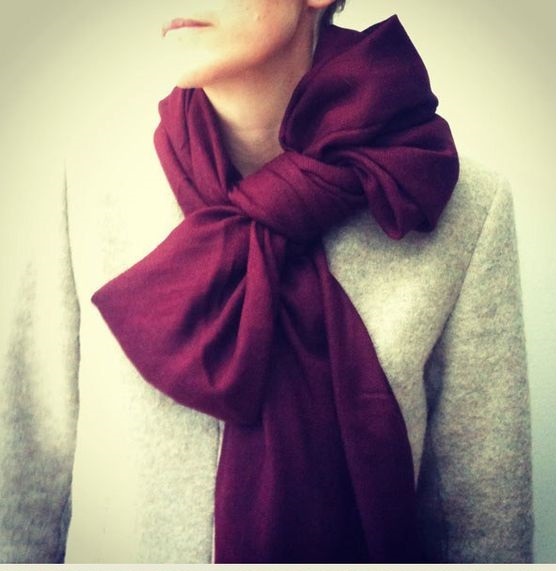 Bring the shorter side of the scarf around the bow and through the middle of the loop. Pull the end of the scarf and adjust the tightness. This is another super simple yet uber-stylish way of tying the scarf. It works best on soft and lightweight scarves having fringes at the edge. Make one side of the scarf longer than the other. 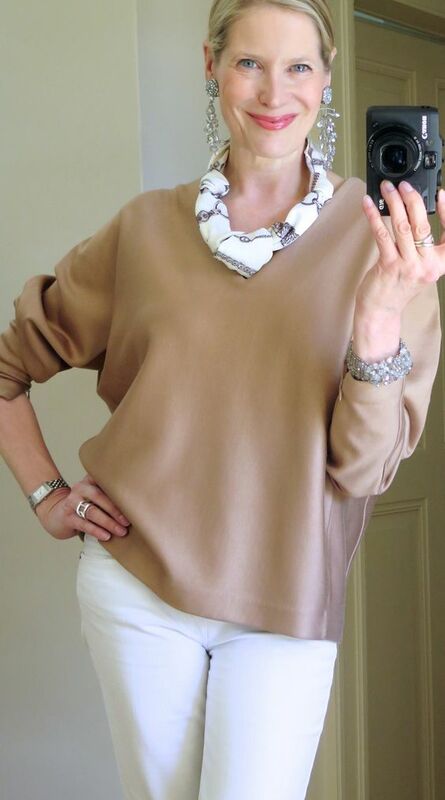 Wrap the longer end around your neck so have a loose ring scarf ring around the neck. Pull the longer end once again towards the backside of your neck and tuck it in behind. Adjust the scarf around the neck the way you want it to fit. This is the easiest way to wrap a blanket scarf around your shoulders in winters. The steps are explained in the image. Drape the scarf around the neck and tie loose ends together at the bottom. Loop the scarf again around the neck. Bring the knot to the front, hiding it inside the loop. Adjust accordingly. 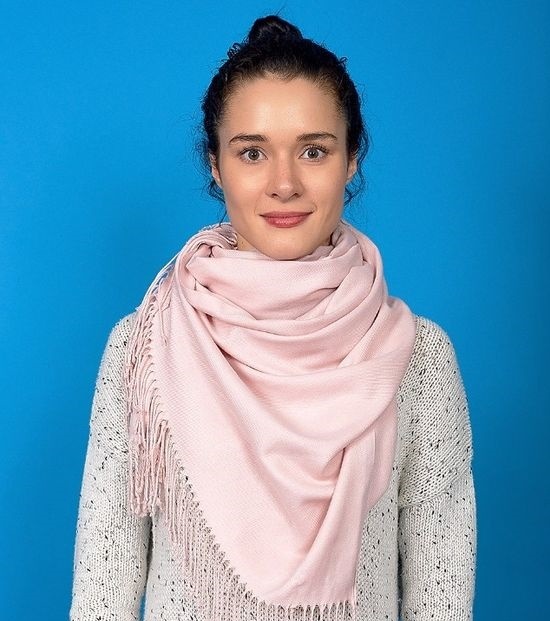 This is another elegant and classy style of wearing a scarf. This style might seem difficult but is actually very easy. All you need to do is tie some knots in the scarf while you are not wearing it. So if you know how to make knots, you can easily do this style. Start with a square scarf made of cotton or silk. Fold the scarf into a triangle. Take the tip of the triangle and fold it onto the middle of the longest side of the triangle. Roll the scarf over and over to make it narrow and do make sure that tip of the triangle is in the fold. Now go to the middle. Start knotting it in a very simple knot. Tighten the knot just a wee bit. Knot the scarf into two more places (or more if the scarf is longer). Tie the knotted necklace behind your neck. This is a versatile and easy way to tie the scarf; it looks classy and will also keep you warm on cold days. Start by hanging the scarf around your neck with one side longer. Open up the edge of the longer side and tuck it on the side of your neck on the scarf’s shorter side. Adjust. 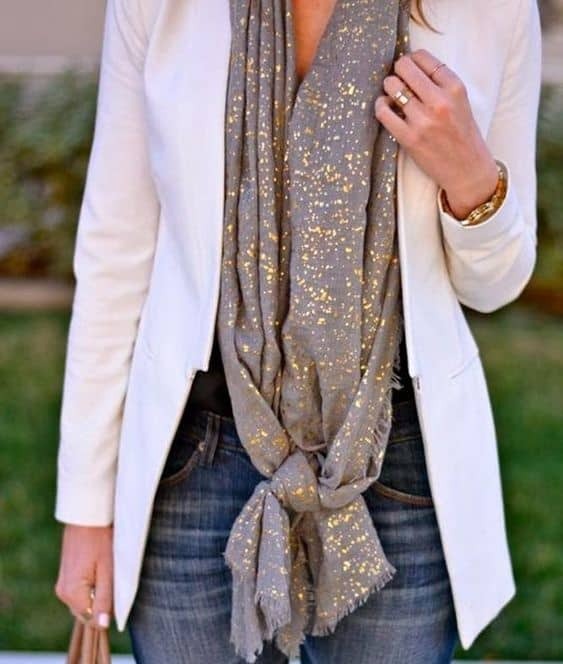 Pair up the low bow style of tying the scarf with a blazer and a pair of jeans to look the classy lady you are. Wrap the scarf around your neck. Make a bow with both ends just below the groin (or slightly higher depending on the length of the scarf). Tie a knot and adjust the bow so that it does not come undone. 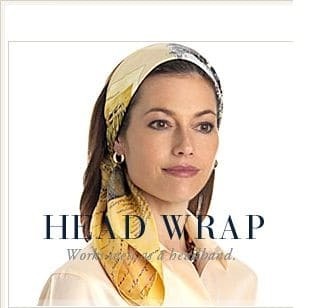 A head wrap or head band is another wonderful way of using your scarf. Fold the scarf along its bias. Grasp both ends firmly and place the folded crease on top of the head. The folds should fall near the hair line. Bring the ends of the scarf nearer beneath the hair. In this position, make a single knot under the hair making sure that the scarf is firmly on top of the head. Now tie a second knot at the nape of the head. Bring the ends of the scarf on one shoulder. 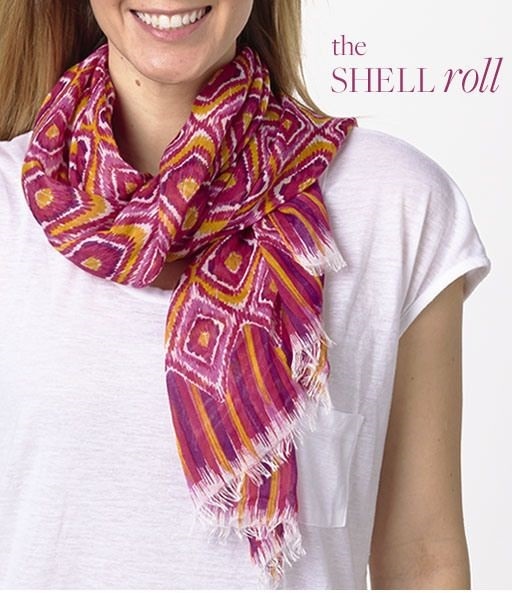 This easy style of scarf is best worn with a full sleeved collared shirt or a crew neck. Take opposite corners of the scarf and alternate fold it inwards towards the center in thirds until you get a 2-inch wide band. 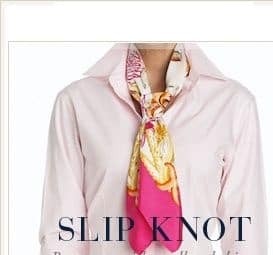 Drape the tie around the neck. One end should hang lower than the other. Cross long end over the other and wrap around behind. Again cross long end in front of short end. A loop will be created in front of your neck; pull the long end through this loop. Hold front of the knot loose with your finger and pull the long end through. Pull the end downward and center knot. Adjust to make loose or taut as you prefer. 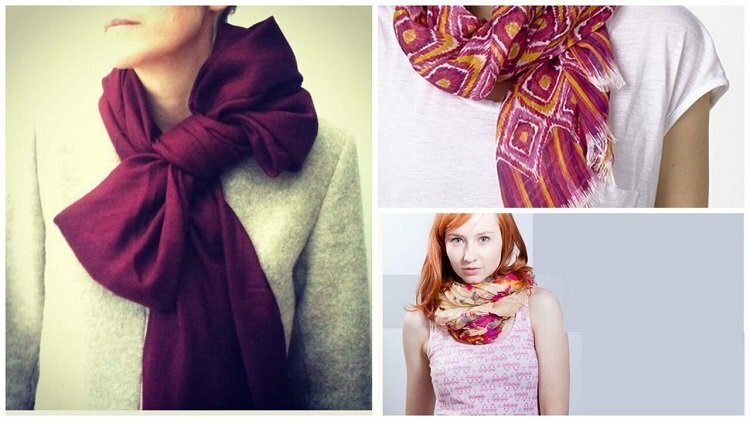 Try these 10 easy ways to tie the scarf and let us know which style you loved!